Is that not the absolute cutest thing you've ever seen? http://www.wubbanub.com/ ~ designed to keep the pacifier conveniently placed to infant. Unfortunately the dragon one seen above is only available (from what I can tell) thru ONE distributor on ebay and of course their price is double what the other animals are.. Still it's adorable & I plan on getting Baby Bug a few :) He will only take the hospital pacifiers which of course don't connect to a pacifier holder. I'll let ya know when I get some and how well they work! 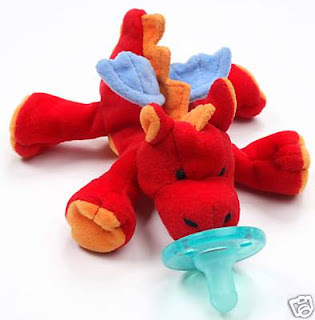 But come on, pacifer + lovey all in one package= baby bliss! What could be better? !